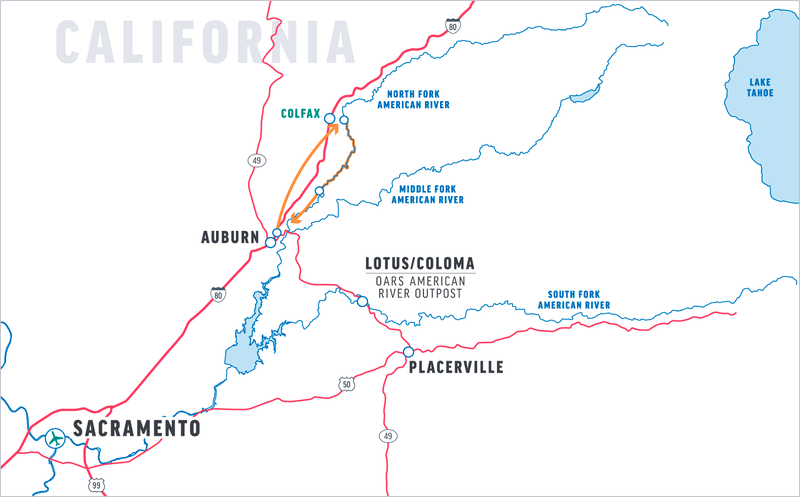 The North Fork is the most challenging fork of the American River—rapid after Class IV rapid delivers a 5-mile run packed with nearly non-stop, white-knuckling whitewater, followed by a stretch of more gentle Class II-III rapids. Intricate boulder gardens, rushing falls and staircase drops promise intense paddling and plenty of adrenaline-inspiring thrills. The North Fork is a wild, untamed Sierra Nevada beauty that is well worth enjoying. The CA State Parks & Recreation strictly regulates our run, assigning weekend launches at 20-minute intervals, from 8:00 AM until 2:00 PM. This means the trip start and end times will vary, though each trip covers the same amount of river miles. When you book your North Fork American trip, we will inform you of your exact meeting time. We strongly recommend staying overnight in a motel near Auburn. Please note that lunch may be served prior to running the river, depending on your launch time. Water levels sufficient for rafting on the North Fork of the American River during the spring and early-summer months are relatively short-lived each season. It is important for our guests to understand that the water flow on the North Fork fluctuates greatly. The river’s free-flowing waters—dependent solely on snowmelt, without dams or reservoirs in the way—keep its season short and sweet! North Fork river trips run from April to as late as mid-June, depending on the preceding winter. Meet at the designated time behind the Raley’s Supermarket. Please be prompt; our designated launch time requires that we arrive at the put-in within a specific window. Once everyone has arrived, we will take a 40-minute shuttle ride to our put-in at the Colfax-Iowa Hill Bridge. Our guides will present a thorough orientation and safety talk then fit you with your safety gear. Then we’re off! Less than a half-mile in, the much-anticipated stretch of Class IV whitewater begins as we enter Chamberlain Falls Gorge. Slaughter’s Sluice is a lengthy series of boulder-choked rapids that leads to one of the river’s most formidable challenges: the crashing, 8-foot drop known as Chamberlain Falls. Zig-Zag, Achilles Heel, and Bogus Thunder are among the continuous steep drops and boulder slaloms we negotiate. After several miles of continuous whitewater, we near the end of the Class IV section—but not before facing Staircase, the river’s most infamous rapid and our rite of passage as conquerors of the North Fork of the American. Come lunchtime, we will pull over to a beach for a delicious picnic. Your guides will lay out an abundant spread of cold cuts, cheeses, veggies and wraps. Lunch is always accompanied by fruit, cookies, cold water and lemonade. Back on the water, we find ourselves floating through an absolutely breathtaking exhibit of the Sierra Nevada’s striking scenery. 2000-foot canyon walls tower around us, creating an intimate gorge of polished granite, clear water, spring-green grasses, deep woods and brightly-colored wildflowers. As we reach our take-out point at Ponderosa Way, our river trip draws to a close. An OARS shuttle will be waiting to give us a 30-minute ride back to Auburn and our vehicles. We will meet you in the parking lot behind the Raley’s Supermarket, 13384 Lincoln Way, Auburn, CA 95603, according to the time our launch occurs for that given day. (We will establish that time for you when you reserve your trip, and will include it in your confirmation paperwork.) Please look for our OARS vans and guides. Click here for a Google map. From Sacramento, take Interstate 80 East towards Reno. About 2 miles east of Auburn, take the Auburn Ravine/Foresthill Road exit (#121). Turn right onto Forest Hill Road, and almost immediately left onto Lincoln Way. Raley’s is on the right-hand side after you turn onto Lincoln Way (northeast corner of Lincoln and Forest Hill). Continue on into the rear of the parking area, behind Raley’s, where you will see an OARS representative. Please be prompt, have all your gear ready, and be dressed for the river! From Reno, head west toward Sacramento, and look for Exit #121 off of Interstate 80. Take a left onto Auburn Ravine/Foresthill Rd and cross over the freeway. Almost immediately, turn left onto Lincoln Way, and follow the directions above to find us behind Raley’s Supermarket. You may want to check one week prior to your trip for an up-to-date weather forecast. We recommend you check the following web sites for weather in Auburn, CA: www.weather.com or http://www.accuweather.com. We recommend starting with bathing suit/swim trunks and a lightweight synthetic shirt. In cool weather, add layers of synthetic long underwear and warmer clothing as needed. Provided wetsuits and splash jackets (on early-season or cold-weather trips) do not include “wetsuit booties” – please bring your own, or wear wool socks with tennis shoes as a good alternative. There are several professional companies taking photos of each raft at the North Fork’s famous Chamberlain Falls, which makes for a very dramatic photo souvenir! These companies are not affiliated with OARS, and you will need to contact them separately to purchase your pictures. Hotshot Imaging is one such company; visit www.hotshotimaging.com after your river trip. (To order your photos online, you must request the photo link for your trip from Hotshot Imaging.) Their phone number is (530) 621-0400. O.A.R.S. West, Inc. and cooperating agencies act only in the capacity of agent for the participants in all matters relating to transportation and/or all other related travel services, and assume no responsibility however caused for injury, loss or damage to person or property in connection with any service, including but not limited to that resulting directly or indirectly from acts of God, detention, annoyance, delays and expenses arising from quarantine, strikes, theft, pilferage, force majeure, failure of any means of conveyance to arrive or depart as scheduled, civil disturbances, government restrictions or regulations, and discrepancies or change in transit over which it has no control. Reasonable changes in itinerary may be made where deemed advisable for the comfort and well-being of the participants, including cancellation due to water fluctuation, insufficient bookings (this trip requires a minimum of 8 guests), and other factors. There is risk in whitewater rafting, particularly during high-water conditions. Rafts and kayaks can capsize. You could be swept overboard. Your guide will make every attempt to assist, but you must be strong and agile enough to “self-help” and “float-it-out” without further endangering yourself or others. We reserve the right not to accept passengers weighing more than 260 pounds or with a waist/chest size exceeding 56 inches. We may decide, at any time, to exclude any person or group for any reason we feel is related to the safety of our trips. We are experienced at accommodating people with various disabilities. Please give us an opportunity to make you feel welcome. We need to discuss any special requirements ahead of time. On advancement of deposit the depositor agrees to be bound by the above recited terms and conditions. Prices subject to change without notice.